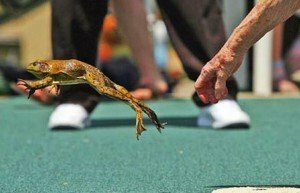 The Calaveras County Fair & Jumping Frog Jubilee — KICKS OFF TODAY! Possibly the longest-running event in the state’s history, The Calaveras County Fair & Jumping Frog Jubilee goes as far back as 1893 and now delights thousands of visitors each year as Calaveras shows off its best in entertainment, exhibits, livestock, arena events and food. What’s with the name, you ask? Mark Twain’s first success was a short story — a funny little tale with a trained frog at its center and Angels Camp (Murphys’ neighbor) as its setting — titled “The Celebrated Jumping Frog of Calaveras County”. With a name like that, the fair has a lot to live up to, so how could it NOT include a frog jumping contest? Yes, indeed, as if all that incredible food, music, arts and exhibits weren’t enough, the Frog Jump is truly unmissable! It’s FOUR DAYS of old-fashioned state fair fun, sensory-overload in the best possible way! With a little something for everyone (or, truly, a LOT of somethings for everyone), the Calaveras County Fair & Jumping Frog Jubilee is quintessential Calaveras and the perfect introduction for those who’ve yet to experience this beautiful piece of the Sierra Nevadas.